New Delhi Nov 24 : Nagaland ’s fascination with all things Korea n is a thing of the past. Japanese fashion and Bollywood movies are now the in thing with the fashion-forward Naga youth. Devjyot Ghoshal finds out what led to the disillusionment with Seoul. The steep streets of Kohima , that once reverberated to everything Korean, are now a smorgasbord of different influences as the current generation of Naga youth, who have grown up in the afterglow of India’s oldest insurgency, attempts to piece together a distinct identity. Theja Meru , a 42-year-old entrepreneur and musician, was the improbable matchmaker of Nagaland’s short-lived romance with Korea and its cultural paraphernalia. At its climax, in the last few years of the past decade, the father of two says that Korean culture had permeated into Nagaland's social fabric so deeply that he was able to convince the state government to open its coffers for the India-Korea Music Festival in 2008. The darkened college-side teashops and kerbside gatherings in Nagaland cities are no longer dominated by Korean cuts or clothes. Instead, the street now harbours aficionados of punk, emo, rock and metal. In the trend-setting corridors of high schools, Tokyo has taken over from where Seoul walked out; from Manga-inspired hair to graphic shirts, there's a new subculture brewing. Ramshackle barber shops, swank clothes outlets and dank second-hand garment markets have all adjusted. For the latter, it is the nature of imports from Bangkok that has changed. In the numerous CD and DVD shops, Korean films and soaps must now compete with Thai, Japanese or even Bollywood productions. And more institutionalised entities, such as a Korean club in Kohima that Meru started in 2007 and the Korean language classes that were held there with government backing, too, have either failed or are about to. At the Hornbill Festival, the state's big December festivity that was a former showcase of this unusual cultural interaction, other preoccupations have taken centrestage. The Korean monopoly stands broken. Nagaland is over Gangnam Style, even as the world today swoons over PSY's billboard topping song. The Koreans have a word for it: Hallyu, the Korean wave. It describes a seemingly unstoppable surge of Korean entertainment, fashion and music. The Hallyu started trickling into Nagaland through Arirang TV, a Korean television channel, about a decade ago. Then, it turned into a torrent as Arirang clearly became, with no official validation, the state’s most watched television channel. Arirang TV fed that hunger. “Maybe there are similarities in values; the tension between generations, for instance,” reflects Longchari. But much more conspicuous are the shared Mongoloid phenotypic traits. For a young Naga, the physical resemblance to a Korean pop-star is much stronger than, say, that with Anil Kapoor or any other Bollywood star. And in a state that is predominantly Christian, where the older generation doesn’t speak Hindi, the family dramas of a Gujarati or Marwari household were alien. “Arirang came straight into their houses and young people here probably felt ethnically connected to the Koreans,” reasons Himato Zhimoni, Nagaland’s commissioner and secretary for tourism, art & culture. Alongside came K-Pop, Korea’s home-grown popular music genre, which caught on fast in this society imbued with the Western musical sensibilities that proselytising Christian missionaries brought with them. Seoul-born entertainer Rain became bigger than Mumbai’s Himesh Reshammiya. That was followed by the arrival of distinctly Korean hairstyles, perfected at local barbershops and salons, and clothes, flown in from Bangkok, to craft that perfect “look” that Nagaland’s fashion-forward teenagers demanded. And so, the Hallyu was embraced. 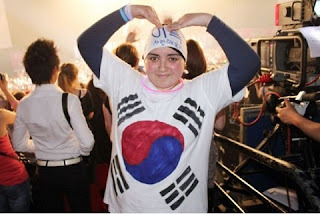 In 2007, Meru founded the Arirang TV Fan Club, a platform for young people with an interest in Korea. At its peak, the club had over a hundred registered members, many of who helped create and manage a separate Korean Pavilion at the Hornbill Festival in 2007. The Nagaland government sponsored a few to even travel to Kolkata, the nearest metropolis, to learn Korean and subsequently, language classes were started at Dream Cafe, Meru’s coffee shop in Kohima. “The government support was massive,” he says. The state government, having been cold-shouldered by its East Asian counterpart, eventually lost interest, and by the middle of 2009, Meru stepped away from the Arirang TV Fan Club. Those who had led the Korean language classes also moved on. “If only their government had invited people from here, it wouldn’t have ended like this,” laments Meru. Without institutional support, the Hallyu waned. Yet, the Naga search for an identity continues, and in it lies an opportunity for the “mainland” to re-engage with young people here who often feel left out on the fringes, both psychologically and physically. “We are still very confused about ourselves. From a society of head-hunters, we directly shifted into a modern, Western society. We are in the middle of an identity crisis,” says final-year college student Anen Molungnenla. While that has meant that foreign cultures are openly embraced, in recent years it has also resulted in sub-continental influences, particularly Bollywood, making deeper inroads into Naga society. “Our fathers lived through and experienced widespread violence. Now, that fear has receded and we are more open, but there’s still some reservation. We don’t know if we’ll be accepted for who we are,” says Anen’s classmate, Vizono. But the change is slowly becoming visible. In CD and DVD shops, the sales of Bollywood films have increased substantially, say local shopkeepers, and in clothes outlets, demand for branded products is booming. “Five years ago, brands didn’t matter. Now, maybe because of promotions, it’s got into their minds. Everyone wants to buy branded clothes. Even Class VI students want Adidas,” says James, the manager of Gravity. With some 8,000 square feet of display space and 24 staff in the heart of Kohima, Gravity clocks sales worth around Rs 40 lakh every month, he claims. And college students here, like Anen and Vizono, admit that they spend “almost all of their pocket money” on clothes, accessories and hair. It’s not as if parents don’t show concern, particularly at absurd haircuts and flashy clothes, they add, and the loss of indigenous Naga culture. But in living room conversation with older Nagas, parents admit that they would rather live with their children doing this than with drugs, a problem that was once rampant in Nagaland. That mainstream, ironically, now swings to Gangnam Style.